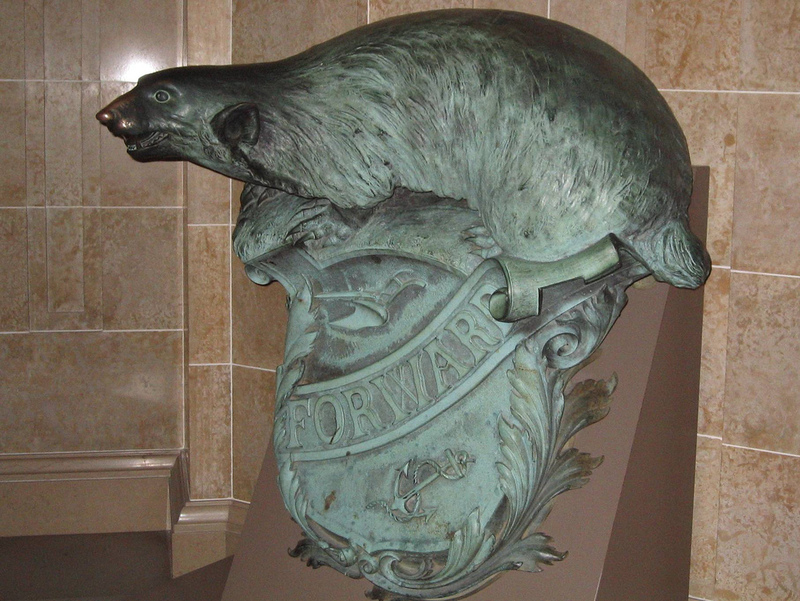 MOTTO - BADGER: The badger is the official state animal and FORWARD is Wisconsin's motto. 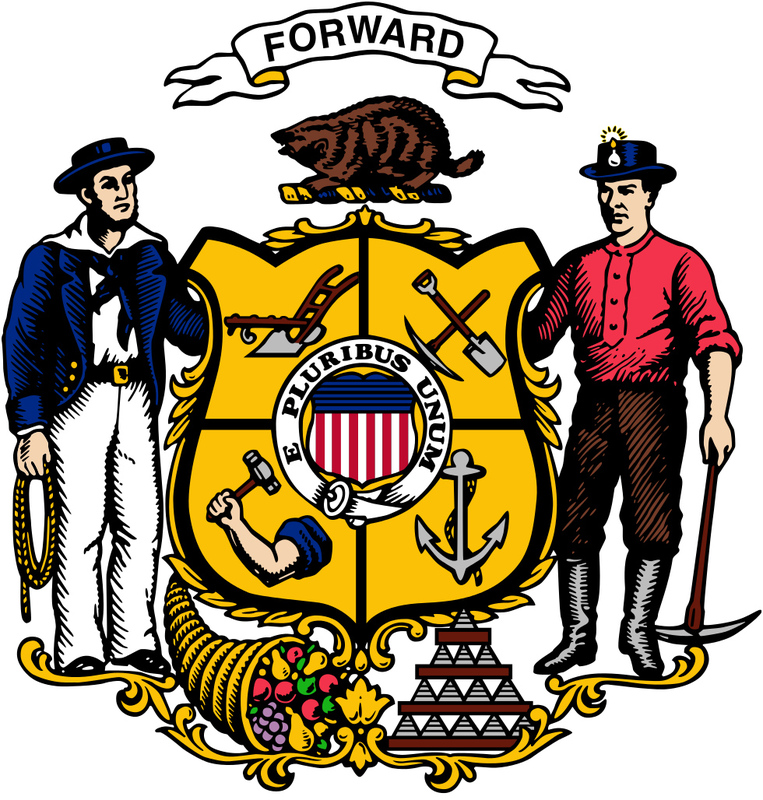 SAILOR - MINER: A sailor and a miner support the shield; these were the two most important industries of the state at the time it was founded. SHIELD - CORNUCOPIA - LEAD BARS: The center of the shield is the United States shield with the motto "E Pluribus Unum" ("one from many," or "from many, one"). 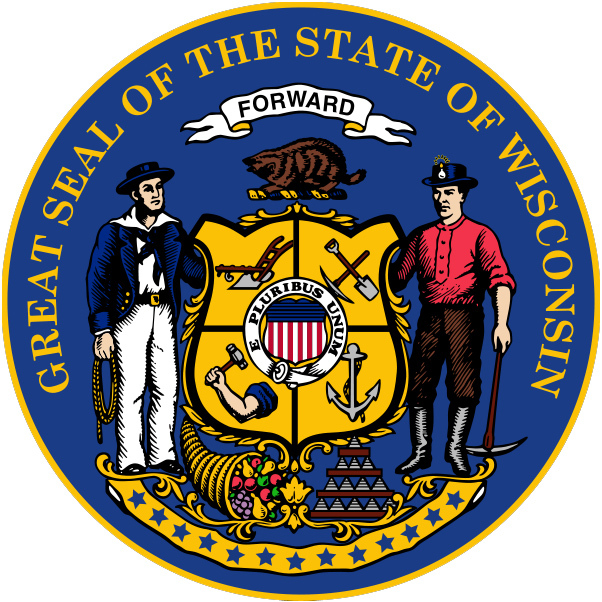 Below the shield are a cornucopia - a symbol for the plenty of the state, and bars of lead to represent Wisconsin's mineral wealth. PICK - SHOVEL: A pick and shovel are symbols of the early lead mining industry; galena ore (lead sulfide) is the state mineral of Wisconsin. The mining of lead ore was the principal occupation of the settlers of early Wisconsin, concentrated in the southwest corner of the state (in what are now the counties of Iowa, LaFayette and Grant - in the 1820's and 1830's, the population of these 3 counties was greater than that of Milwaukee or the east coast of Wisconsin. PLOW: A plow represents the farmers and agriculture of Wisconsin. ARM & HAMMER: An arm and hammer represent Wisconsin's artisans and laborers. ANCHOR: An anchor is a symbol for the sailing and shipping industry. The western edge of Wisconsin is the Mississippi river (the chief shipping lane of mid-America during the early 1800's) and the upper part of Wisconsin is bounded by Lake Superior (source of the shipping trade for eastern Wisconsin).